Lou Tate Bousman, known professionally as Lou Tate, was born in Bowling Green, Kentucky, on October 19, 1906. Her ancestors were settlers in Virginia as early as 1790.? Her father, J. H. Bousman, migrated as a young man to Kentucky where he became a conductor on the old L&N Railroad. ?In 1920, he was transferred to Louisville and the family bought a house at 1725 South Third Street. 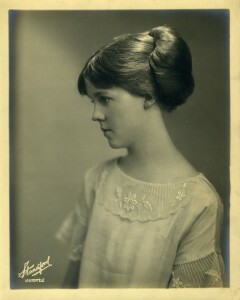 Lou Tate graduated from the Louisville Girls High School in 1924.?She spent one year at the University of Louisville before enrolling at Berea College where she earned a B.A. degree, followed by a Master of Arts in History from the University of Michigan. Her interest in weaving began when she received five generations of weaving patterns from an elderly weaver, Miss Nan Owen. ?From then on she began her unique contribution as an American hand-weaving historian. Collecting old patterns, called drafts, took her into the far reaches of Kentucky ? often on horseback. 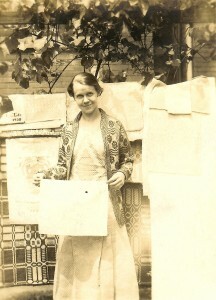 Her first local exhibitions of Kentucky hand weavings were held at the J. B Speed Museum in Louisville in 1937. During the depression, she worked at President Hoover?s Dark Hollow School for mountain children deep in the Blue Ridge Mountains of Virginia. ?Her contacts with Mrs. Hoover led to the development of the Lou Tate Table Loom (the Little Loom), first constructed by Dr. S. W. Mather, a Louisville dentist.?Mrs. Hoover had approached Tate for a weaving project suitable for girl scouts, one of Mrs. Hoover?s main interests. ?Her Little Loom was sold for over 20 years, both in this country and abroad. ?Many of her looms are still in use today. Later, Tate and her loom were given national exposure in Eleanor Roosevelt?s syndicated column, My Day. ?In the early 1940?s, Mrs. Roosevelt paid a visit to the Little Loomhouse and ordered a woven luncheon set for the White House. In the 1940?s, Tate started an experimental weaving group, The Kentucky Weavers Guild, and started publishing the Kentucky Weaver Magazine. ?She also began collecting contemporary hand-woven textiles in addition to her collection of traditional woven coverlets, which were exhibited both nationally and internationally. ?Tate?s custom weaving business soon gave way to her first love, teaching?particularly introducing young children to this ancient form of folk art. Her own methods of teaching very young children also stimulated interest in history. ?During World War II, Tate extended her weaving skills to helping the hospitalized soldiers as a good form of physical therapy. 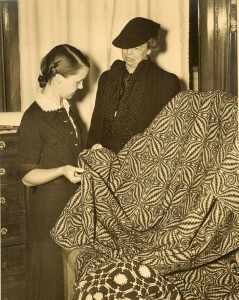 She published several booklets and magazine articles on Kentucky weaving history, early coverlet patterns, and weaving techniques. Spinning was added in the 1970?s. ?She used the cabins for many open houses, as well as formal classes and workshops. ?She also taught college extension courses in the greater Louisville area and surrounding states. Unfortunately, illnesses and lack of resources to maintain the cabins plagued the last few years of her life. However, her contributions to the revival of hand-weaving in Kentucky, the preservation of old coverlets and their patterns, and encouragement of the contemporary experimental weaving were a true legacy in this field of folk art.